2. In a medium sized bowl, sift together flour, cocoa powder, baking powder, baking soda, salt and coffee. Whisk well to combine and set aside. 3. In a large bowl, beat the butter until it is creamy using a hand/stand mixer. Gradually add the sugars and beat on low until the mixture is light, fluffy and has an almost mousse-like texture (the time it takes to do this will depend on your mixer). 3. Whisk eggs with extracts in a small bowl and gradually add to the butter and sugar mixture, mixing until it is well combined. Be careful not to over-mix. 4. Add the flour mixture and buttermilk to the butter mixture, alternating between the two and starting and ending with the flour mixture. Mix to combine gently. 5. Pour mixture into prepared tins (you should have about 972g of mixture in each cake tin) and bake for 20-25 minutes or until a skewer comes out clean when inserted. 6. Leave cakes to cool for at least 10 minutes before inverting onto a cooling rack. Once completely cool, level the cakes by cutting the tops off (see notes above for tips on this). 7. 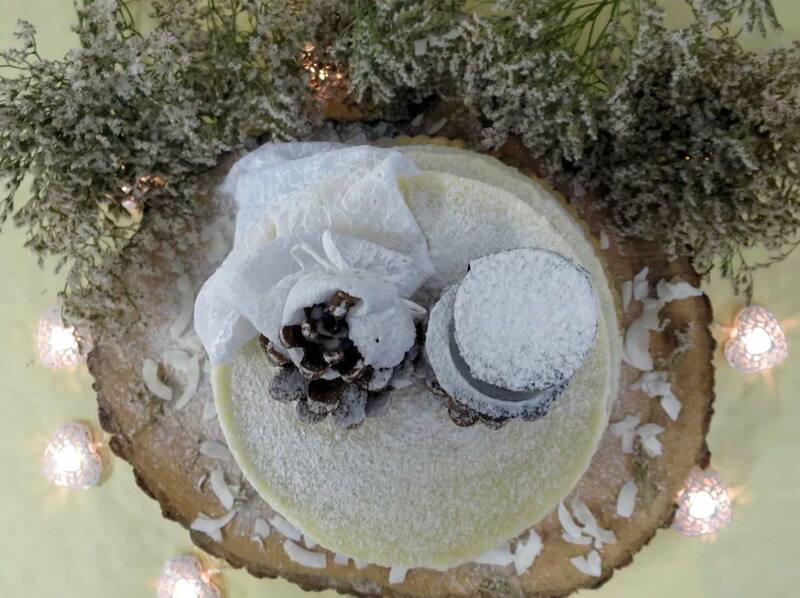 To assemble, place once cake on a cake plate, cover with buttercream and top with another cake. Repeat this process with the third layer and top with more buttercream and shaved coconut. Using a hand/stand mixer, beat the butter and salt together until creamy. Add icing sugar and continue beating until the mixture resembles ‘sandy rubble’. Gradually add the milk (just a little at a time) and extract until you achieve the desired consistency. Add more icing sugar for thicker buttercream and more milk/cream for a thinner, lighter buttercream. If you only have one cake tin, you can bake 2/3 of the mixture at once and then the last 1/3 separately (using a scale to weigh). The cake with 2/3 of mixture will take roughly 35-40 minutes to bake. 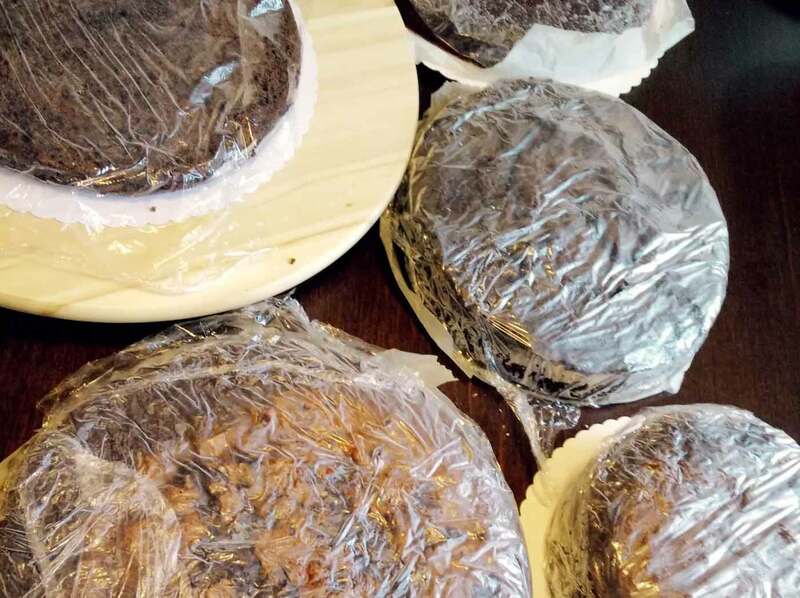 ** If you are not using your cakes straight away, they can be wrapped in plastic wrap and stored in the freezer. Defrost slightly before leveling and applying the buttercream. This cake is perfect for all occasions whether it be for a wedding, birthday or simple afternoon tea with friends. It makes one 9 inch layer cake. Two of the sweetest people I know got married last weekend and I had the daunting job privilege of making their wedding cake. 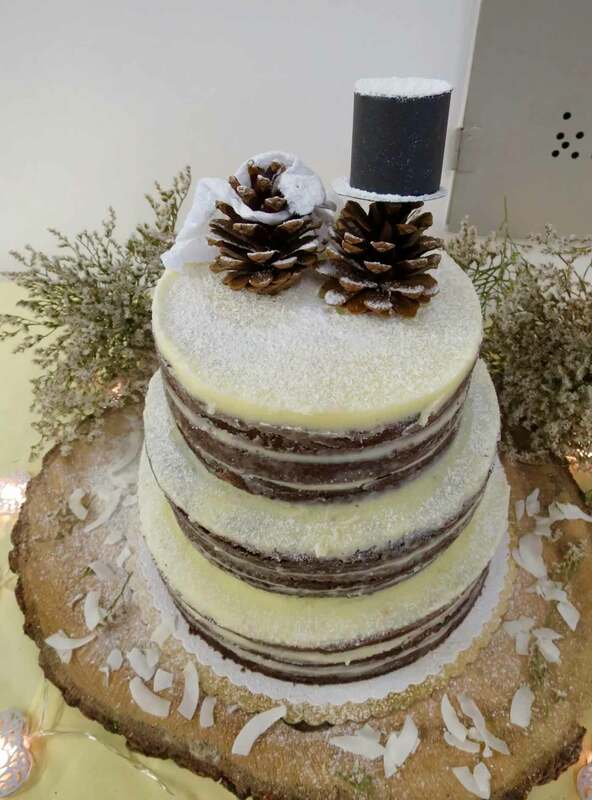 They wanted a winter-themed cake complete with two cute pine cone toppers – one with a top hat and one with a veil and thus chose a naked rustic wedding cake: Chocolate-Coconut flavour with a Coconut Buttercream. I love naked cakes and I was so happy when the bride and groom chose this for the occasion. These cakes have a simplicity, beauty and charm about them which I think makes them the perfect wedding cake. You may remember reading this post where I mentioned I was undergoing some serious trial and error for a special event. Well that special event was of course this wedding and to my relief none of the five cakes I baked sunk (phew). 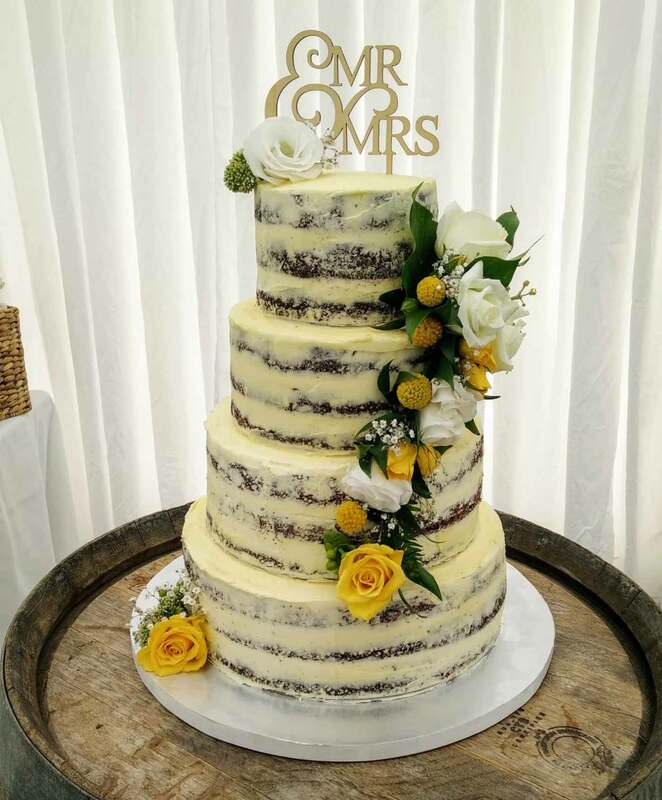 Although I’ve baked an entire spread for a ‘Sweets Bar’ at a wedding, I’ve never made the actual wedding cake before and hence I was a little nervous. I had so many questions like – how many cakes will I need to bake? How do I alter the recipe to fit the different sized tins and to ensure they are all exactly the same height? How do I make sure all my layers are completely even? And how do I stack my cakes on top of each other without them sinking/collapsing? 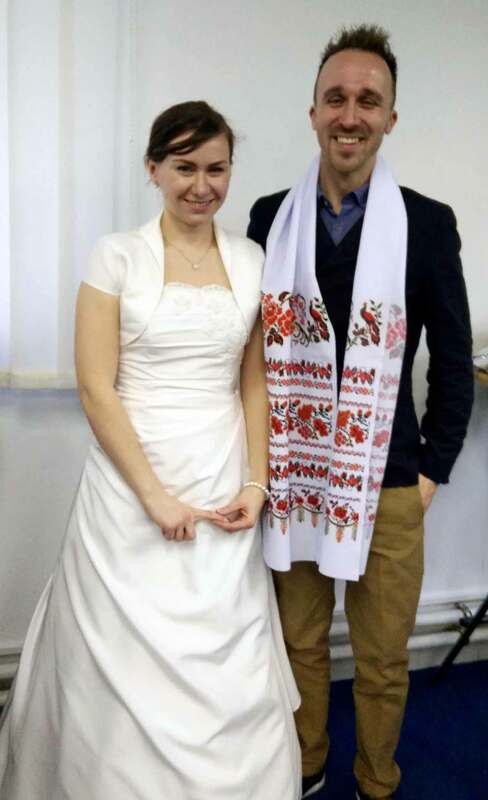 Thankfully I eventually found the answers – it turns out however that there are not many recipes for making wedding cakes online which came as a surprise to me. All I needed was a recipe that could be used for three different sized cakes that would feed x number of people. Apparently this was too much to ask, but thankfully it wasn’t too much to figure out myself. 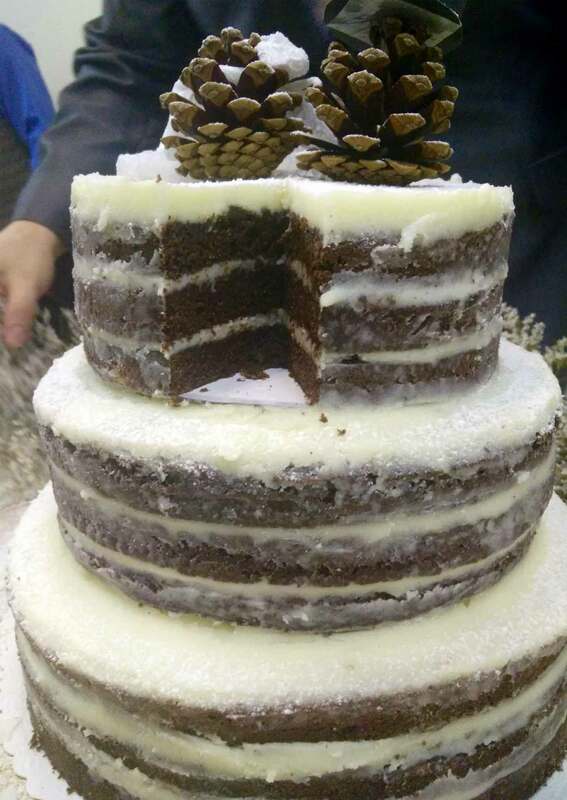 The bride and groom have fantastic taste and requested a chocolate coconut cake. To get this flavour I thought adding coconut cream/milk would be perfect. When I tried this, the cake had a beautiful velvet texture however no coconut flavour at all – bummer. I didn’t want to use actual coconut in the cake to avoid seeing white ‘fleck’s of coconut throughout the cake, thus I settled on coconut essence (extract would have been perfect l but I couldn’t get my hands on any). 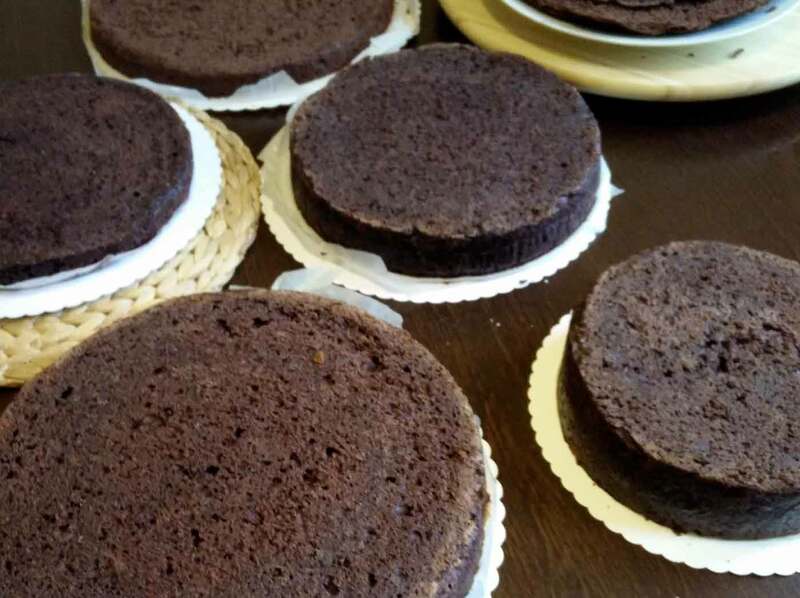 I love oil based cakes for their moist texture however they are typically very soft cakes and don’t do so well when layered and tiered, thus my choice was a butter-based cake, which used the creaming method. The recipe I ended up using was a mixture of my own creation and Joy The Baker’s Chocolate Layer Cake, from her book ‘Homemade Decadence’. My biggest fear was not having enough cake to feed everyone’s cake-hungry tummies. 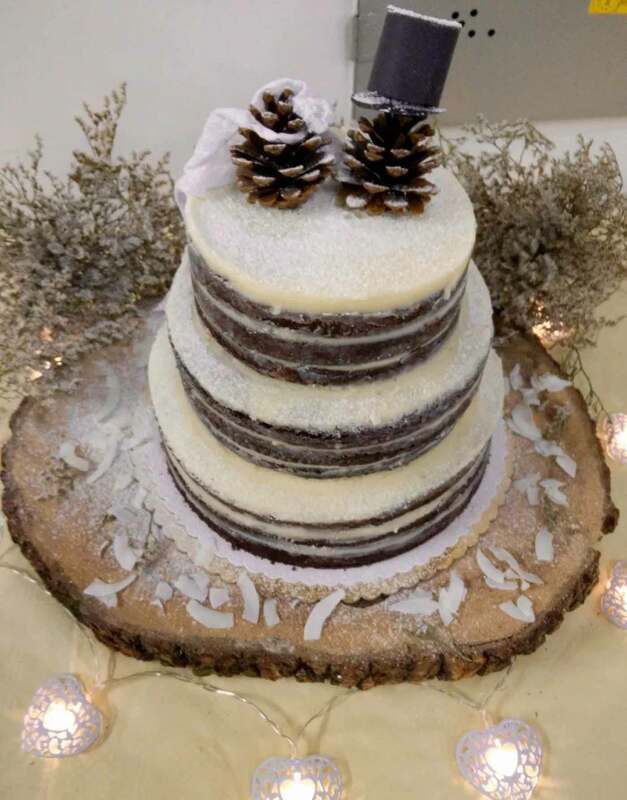 The number of people the cake needed to feed was close to 80 so I called on Kevin’s mathematician genius to confirm that my initial choice of a 7 inch, 9 inch and 11 inch tiered cake would be enough. His maths said it was exactly the right amount with a few extra pieces to spare, which was a lucky guess of mine. I then had to work out how to make my recipe fit the three different size cake pans but all be equal in height. There is a super useful trick to help when adjusting any recipe to fit a desired cake tin and I highly recommend reading this post here. Basically all you need to do is work out the surface area of the cake tin which is π r2 (3.14 x radius of the cake tin squared – don’t get put off by the ‘ π ‘ sign!). You then divide or multiply the original recipe by the surface area of the tin you are wanting to use depending on if it’s bigger or smaller than your desired cake tin. My original recipe was for a 9 inch cake tin and I needed to adjust it for the 7 inch and 11 inch cake tin. The surface area for the 7 inch cake tin was 39 square inches and the surface area of the 9 inch cake tin was 64 square inches. 94 divided by 64 = 1.48 (I rounded this to 1.5 and multiplied the recipe by 1.5) – again, easy, magic! I’ve never been good at maths (ever) hence I was so happy when I found this easy to use formula. Although less time consuming and easier, you don’t necessarily need three cake tins of each size to create your 3 layers. I don’t have three pans of every size so had to get a little creative. I have a deep 7 inch cake tin so I baked the cake all in one tin then cut it into three layers. My 9 and 11 inch cake tins are not so deep so I baked 2/3 of the mixture and then when the cake was cooled and inverted onto a cooling rack, I baked the remaining 1/3 in the same cake tin. I was a little concerned that the last 1/3 would not be so successful due to the mixture sitting for a while before being baked, but it was surprisingly still perfect. To avoid a manic rush of baking cake, making buttercream and assembling the cakes all in one or two days, I staggered the jobs by baking one cake one day, freezing it, then baking the other cakes at my leisure and freezing them too. The day of and before the wedding all I needed to do was level the cakes, fill them with buttercream and assemble. In order to achieve a super flat cake, I cut the tops off which also meant that all my layers were roughly 2.5 cm high. Leveling cakes is important for ensuring a flat and straight cake so that they look perfect and not ‘wonky’ when stacked/layered. 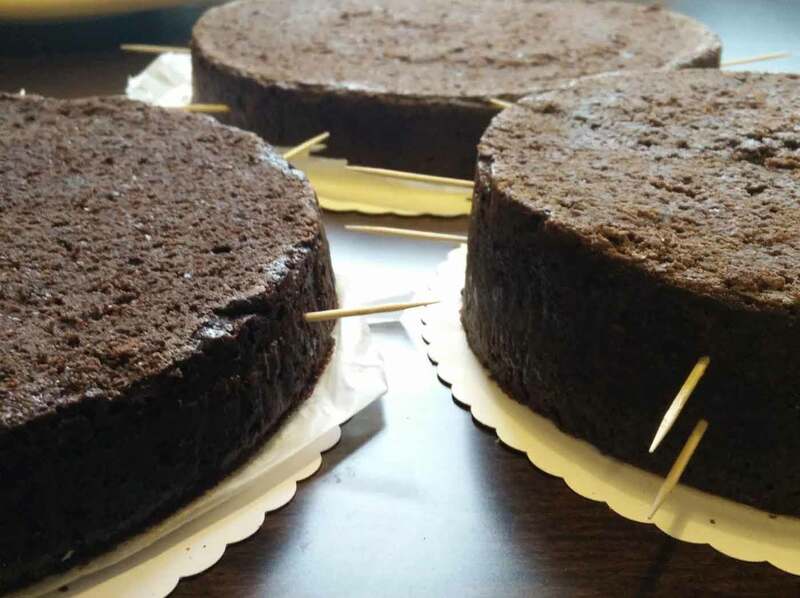 Tip: Having the cakes slightly frozen helps a lot when cutting the cakes even as they are more firm and robust. To cut a cake into one or more layers, simply insert a toothpick at the point you want to cut and continue to insert more toothpicks at the same point all around the cake. Using a serrated knife, ‘saw’ a mark around the cake, using the tooth picks as a guide (the knife should be sitting just under the toothpicks). Once you reach your original mark (i.e. the first toothpick), you can then take the tooth picks out and continue cutting the cake all the way through. Insert two toothpicks into the each layer you have just cut, both in line with each other – this indicates which way to put your layer back on the cake once it has frosting on. You can have all your tiers and decorations ready to go and assemble the cake at the venue. I did the latter and found this the easiest but it depends on how far you have to travel and how many other hands you have to help! The cake is sitting on a ‘tree trunk’ which the bride and groom organised and was a great addition. 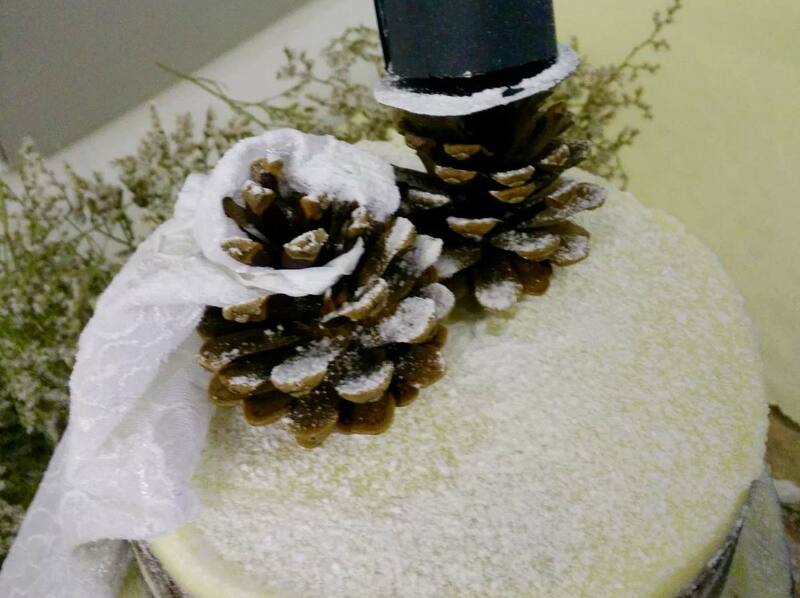 Cutting the cake – When the cake is ready to be cut, you can easily take the tiers off and start cutting. My maths magician of a husband worked out the exact size of each piece so that we had a good idea of how many pieces we could get from each cake. I was surprised to learn the bottom tier (the 11inch) was half the volume of the entire cake and served 40 people. 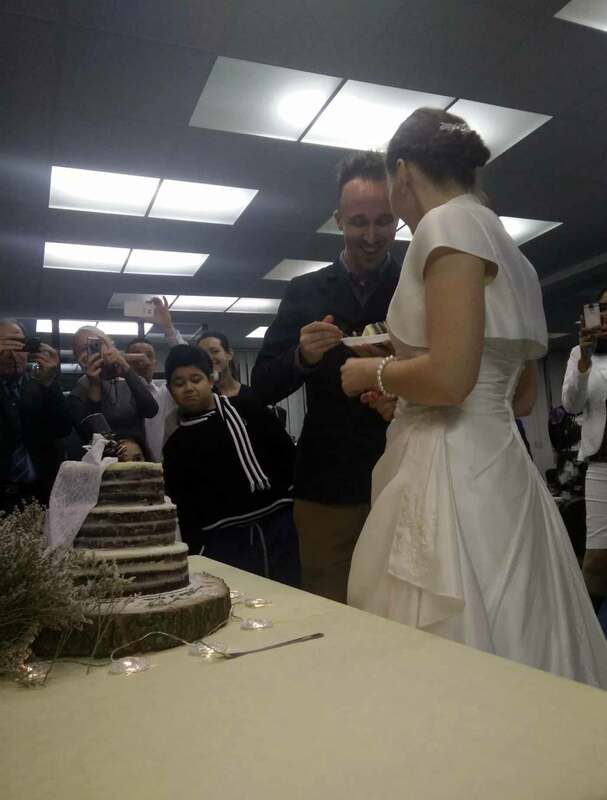 …and that’s the wedding cake process 101 in short – it turns out that it wasn’t so scary after all. Check out the recipe below for the 9 inch cake so that you can give it a go yourself – it’s a mouth-watering cake, and is beautifully moist even without the oil. If you’d like to make if for a different size tin, simply use the formula above to adjust – easy.